Der Bass ist gut! Das war's dann aber auch schon! The beat is quite cool, but this is just a terrible song with terrible lyrics. Boy, are those lyrics just diabolically awful. 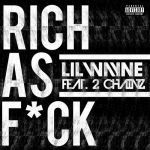 Seriously bad.<br><br>At least Lil Wayne's new album title is fitting. Oh god this is possibly the worst collaboration ever. Both those artists are awful and this is no exception. Lyrics are especially crap. I actually quite like the beat. But everything else about this is just awful.